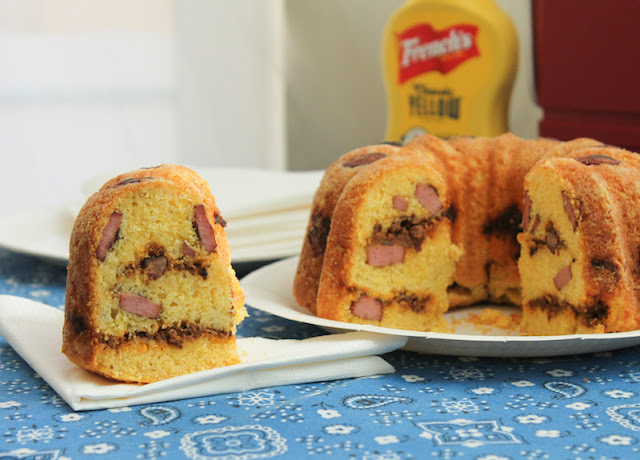 Hot dogs and spicy beef chili are baked up in a cheesy cornbread batter to create a savory chili cheese corn dog Bundt you can slice up and serve at your next party. One special treat I loved as a child were the fried corn dogs only sold at ball games in the concession stand. They vied for favorite status with Frito Pie, that is, Fritos served covered in chili, and nachos, crispy tortillas smothered with melted cheese food product. I have no idea if any actual cheese is involved in the making of that sauce but it is fabulous. I would go to a football or baseball game just for the food. 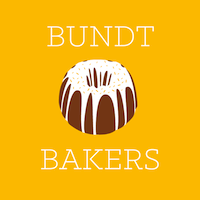 When our host of this month’s Bundt Bakers event decided on tailgating Bundts as our theme, I knew I wanted to create a Bundt that had elements of my favorite ballpark snacks. I started with my mom’s homemade cornbread recipe – it’s the best and I really should share that sometime soon – then I added the rest. Talk about good! 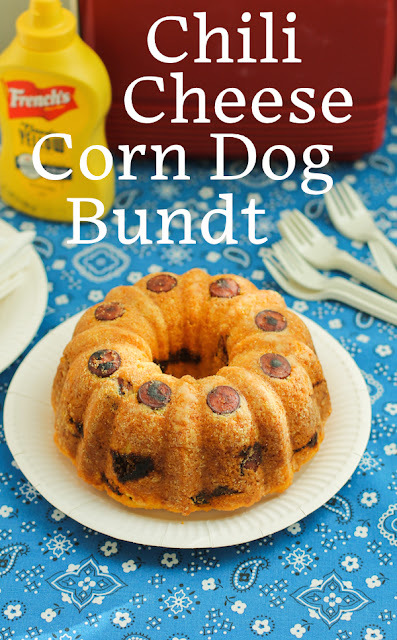 This would be great to take along to any tailgating party or neighborhood potluck. 3/4 cup or 200g chili - homemade or otherwise. Mine was from this recipe. 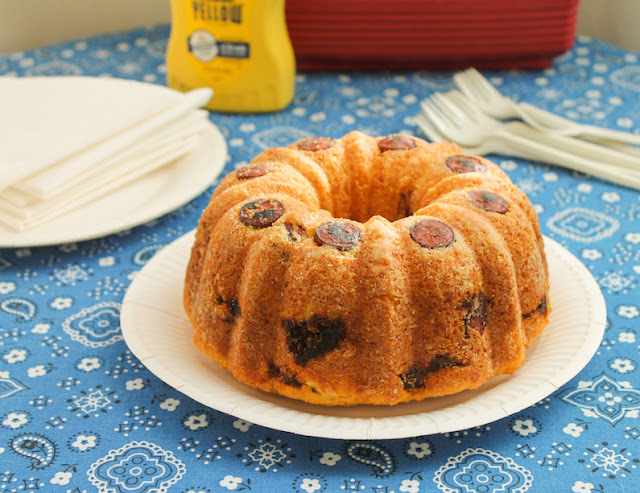 Preheat oven to 350°F or 180°C and liberally grease and flour your 6-cup Bundt pan. 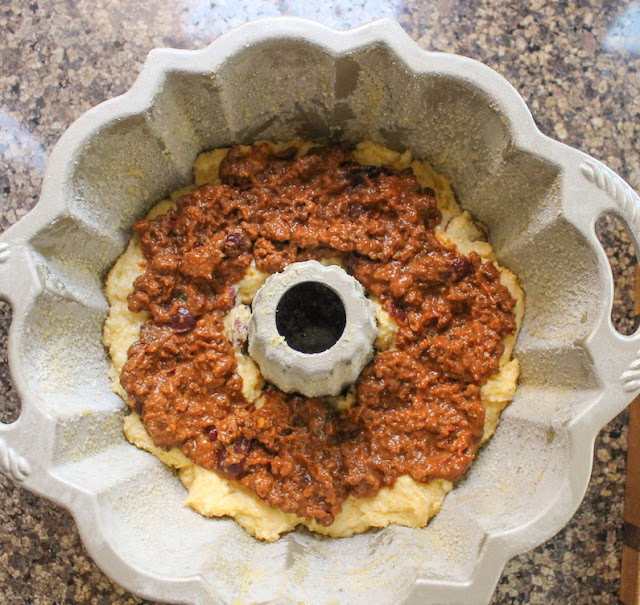 I used a combination of flour and cornmeal for mine. 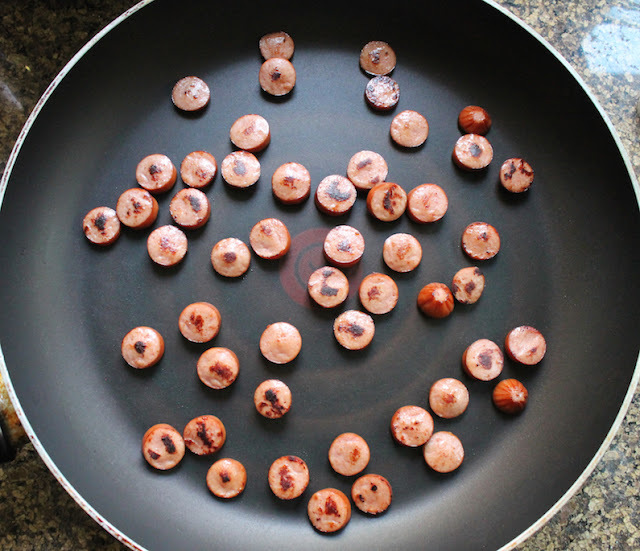 Slice the hot dogs into thick circles and fry them gently for a few minutes in a nonstick skillet. This removes some of their moisture. Set aside to cool. In a large bowl, combine cornmeal, flour, sugar, baking powder and salt. 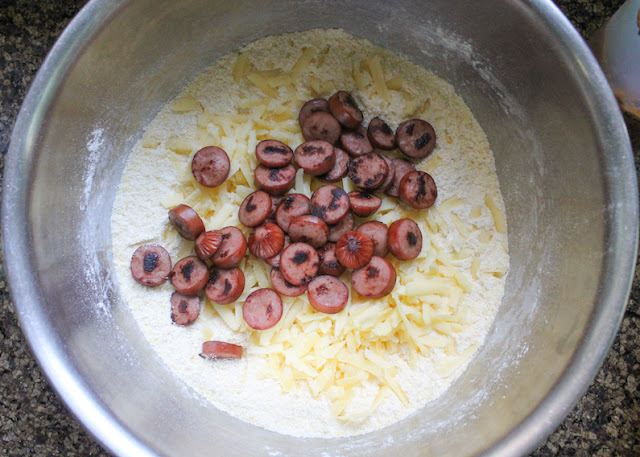 Add in the cheddar cheese and sliced hot dogs, stirring well. 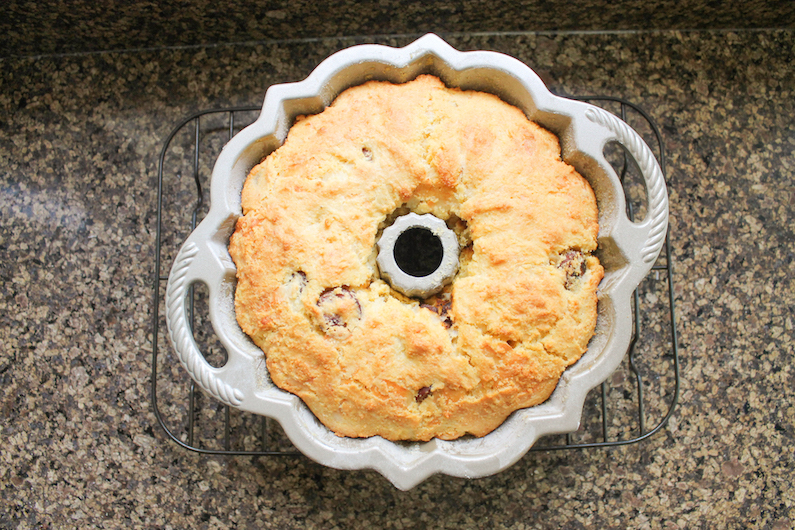 I set aside 8 slices to put on the bottom of the Bundt pan before adding the batter. They came out pretty cute so you might want to do the same. In another bowl, beat together the milk, egg and oil. Beat until fairly smooth, about one minute. 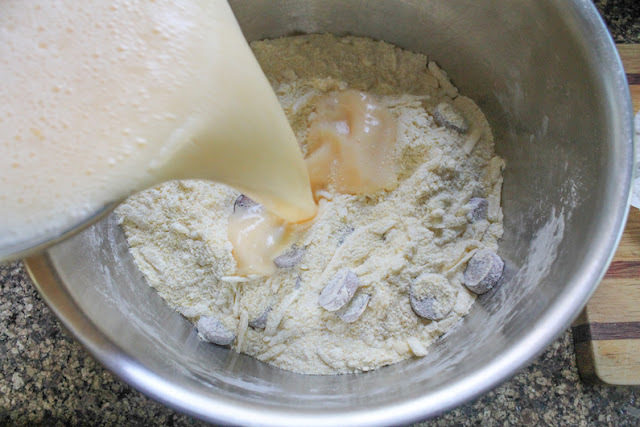 Fold the dry ingredients into the wet and stir until they are well combine. If desired, put slices of hot dog around the bottom of your greased and floured Bundt pan. Spoon one third of the batter into the Bundt pan. Spoon half of the chili on top. 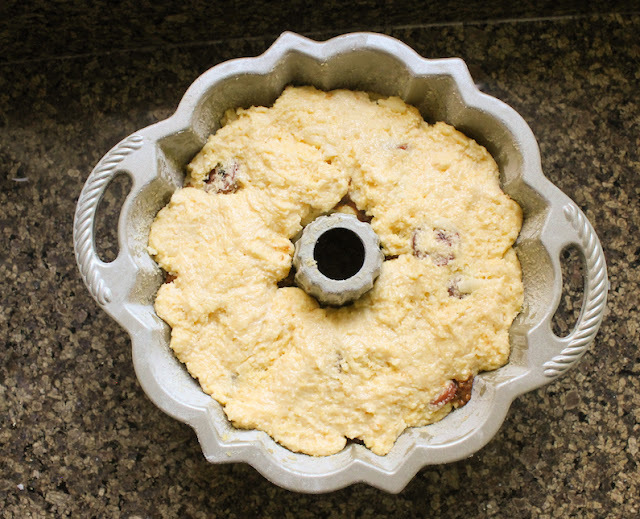 Top with the second third of the batter. Add the rest of the chili. Top with the last of the batter. In other words, it goes 1. batter 2. chili 3. batter 4. chili 5. batter. Bake in the preheated oven for 30-35 minutes or until it's lightly browned on top and pulling away from the sides slightly. Remove from the oven and let to cool for a few minutes. 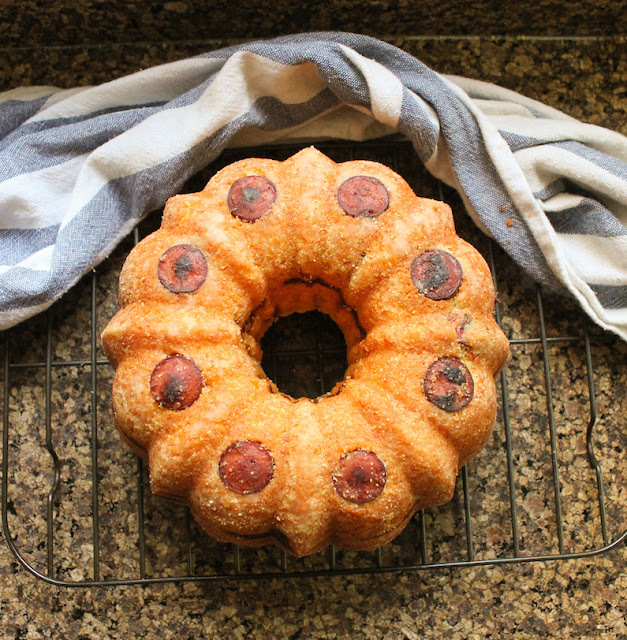 Turn the Bundt out onto a rack to cool for another 15 minutes before slicing to serve. Every month my Bundt Bakers group gets together to bring you creative treats baked in Bundt pans. Sometimes they are savory, most times they are sweet, but they are always delicious. Check out this month’s list below. Many thanks to our host Sue of Palatable Pastime for coming up with this fun theme and all her behind the scene work.